If number 1, then keep what you have. Your website is your most important salesperson. Currently they are going to a website that isn’t built to close sales or generate leads. Potential clients visit your lawn care website and in a matter of minutes judge your your business. They do so based on how it looks, what it says and what it proves. If you or your buddy built it then the website most often it looks like you did it yourself and projects an image of a struggling “company” that is just one guy and a truck and all the assumptions that come with that. He doesn’t have insurance, doesn’t show up, breaks sprinkler heads, lets the dog out… all of that can be assumed by how unprofessional a website is. You must project the image of a larger organization even if you are one guy and one truck. Not doing so hurts your sales. Would you hire a housekeeper that showed up at your door in a wife beater and cut off jean shorts smoking a cigarette? Secondly, (what you say) the text you use on your lawn care website sells visitors on YOU. Do they have to hunt for information? What areas you serve? What services you offer? Do they know why they should use you instead of the guy that is 50% cheaper? Most websites are just as generic as the next competitor… and when you sound the same and look the same you force yourself to compete on price… But when you look, sound and act like something different and better…. You CAN charge higher prices. Thirdly, visitors want proof that you do what you say, that means reviews with photos, testimonials, video and a strong guarantee…. Those 3 things are just the blatantly obvious stuff (to me). Lets go deeper… from a technical standpoint… no professional marketing agency will offer to do SEO on the old technology that your website is currently built on. We require a content management system that gives us total control over the code and that meets Google’s best practices for SEO. And finally, we know for a fact that the website layout, content and elements affect the number of leads you get. Every split test we have ever done proves this fact – and since we only work with lawn care companies we have the largest data segment to test from. Every additional field your add to your estimate/contact forms hurts the number of leads and amount of money your lawn care website will generate. These are facts. Its proven plan as day in the results of our split testing. Your website exists to MAKE MONEY. It can only succeed at this if visitors take 1 of 2 actions – Pick up the phone and call you or complete a short estimate form so you can sell to them. As a business owner we can just ignore this and not care about the lost revenue or we can invest in a site that is designed specifically to convert lawn care leads to clients and capture that revenue we are currently throwing out the window. Your lawn care website is the most important salesperson you have and currently it is not being treated as such. Lets say every year you only get 100 visits (this is exceptionally low) to your current website and from those 100 visits you get 5 new clients… and those 5 new clients are worth $5,000 a year. So your current website is generating $25,000 in business a year. Now, if your site was being treated as a salesman and was designed properly, looked like a larger company (not a guy and a truck) – instead 5 new customers it could convert 30 or more of those 100 visitors to clients…. That is $150,000 a year. Which means you made an additional $125,000 in new client revenue just because you changed your website and nothing else…. So would you rather have salesperson that generates $150,000 year or are you content with $25,000? It’s a simple decision in my opinion. Fixing your lawn care website should be the first order of business even if you do no additional marketing this year. 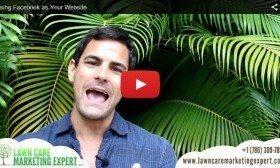 ‹ Google My Business For Lawn Care Businesses – Important Changes You Need to Know!